You likely know all too well that a poorly functioning sink quickly becomes a very big inconvenience. While you may first start pouring drain cleaning products down your sink (this is not recommended as these chemicals actually damage your pipes in the long term), drain cleaning services are the best solution when it comes to drain cleaning. Here are some signs your sink is clogged. If your sink is draining very slowly, this is a tell-tale sign that you have a clogged sink. If this is the case, the clog is likely in the fixture itself. Although you may be tempted to put off fixing the problem, it is important that you do something about it right away so that you don’t damage your pipes further. Even seemingly minor clogs can cause serious problems and even damage your entire system. If the clog is particularly bad, the sink may not drain at all. There are many unsuspecting things that can cause your sink to clog. From hair, toothpaste and soap in bathroom sinks to grease and food in kitchen sinks, we really do have to take care with just about everything that we put down our sinks if we want to avoid clogs. Do you notice odd or unpleasant odours coming from your drain? Foul smells often occur well before any other obvious signs, so this is not something to ignore. If you notice any gurgling noises coming from your drains or from the pipes, this could very well be because your sink is clogged. The safest method to unclog a sink is to use a plunger. However, some clogs are so thick that regardless of how you go about trying to fix it, it will be to no avail. If this is the case, you will want to contact a professional plumber who offers drain cleaning services. Keep in mind that regular drain cleaning maintenance, such as running hot water down your kitchen sinks on a weekly basis and using a vinegar and baking soda solution on a monthly basis, can help you to keep your drains in peak condition and prevent clogs. And, of course, avoid putting anything down your sinks – especially kitchen sinks! 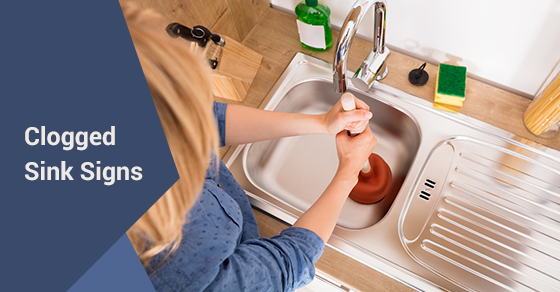 If you have a clogged sink and are in need of drain cleaning services, contact our team of experts at Brothers Plumbing today. We have over 50 years in the industry and offer affordable rates.